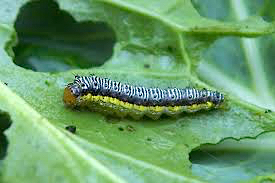 European corn borer (ECB) moths are nearly non-existent now. There are no particular areas of higher activity, and no map will appear in this edition. It is unlikely that we will realize any further injury from this pest this season. Nearly all remaining sweet corn plantings are now in the silk stage. Fall armyworm (FAW) however, continues to be a threat to these sweet corn plantings. We should expect this pest to be with us at some level for the remainder of the sweet corn growing season. FAW do not respond well to pyrethroid insecticides. The most useful products are those in the IRAC group 28 class (Coragen, Exirel) or the IRAC group 5 class (Radiant, Entrust), or combination products including these classes. See the 2016 Commercial Vegetable Recommendations Guide for insecticides effective against FAW. Corn earworm moth (CEW) activity has declined with cooler evening temperatures over the past week. Patches of locally higher activity remain (see CEW map). Catches are now rising and falling with night time temperatures. It is advisable to incorporate materials into the spray program that have different modes of action from the pyrethroids. This includes IRAC 28 materials like Coragen, Exirel and Besiege, as well as IRAC 5 (Radiant, Entrust (OMRI approved), and Blackhawk)). Growers should be checking CEW activity frequently, and adjust spray schedules according to local activity. On this map, green areas correspond to a 3-4 day silk spray schedule. 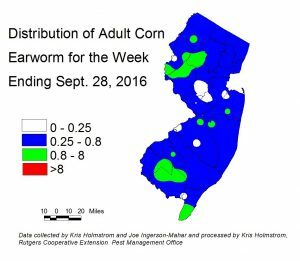 The limited CEW pheromone trap network also registered declining catches in the south Jersey counties over the past week. Damaging CEW moth populations remain throughout southern NJ (see CEW pheromone map). The low number of traps results in broad areas of color within the map. 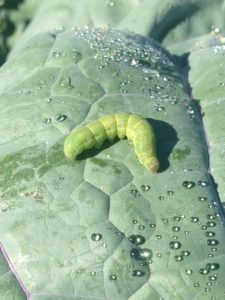 It is critical that growers monitor local CEW moth numbers. At present, this population constitutes a significant threat to silking corn. On the pheromone trap map, the green areas correspond to a 3-4 day silk spray schedule. BMSB numbers are at very low levels in blacklight traps, and no map will appear in this edition. BMSB may still be a threat to orchard crops at this time. 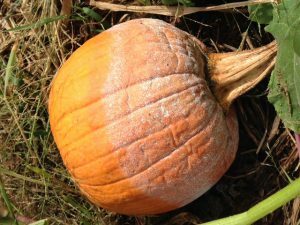 As mature pumpkin and winter squash fields decline, the treat of downy mildew (DM) to these crops also declines. Many fields are now being harvested, or opened for U-Pick. As DM is solely a foliar disease and foliage is now largely down, it’s impact would be minimal on these crops. It is still a threat to late planted cucumbers. For more information on the regional presence of DM as well as comprehensive, weekly forecasts, see the following website: http://cdm.ipmpipe.org. Melon aphid is common in pumpkin fields at this time. This pest is capable of producing sticky droppings that can accumulate on the surface of fruit. This condition is unsightly and problematic, especially in U-Pick situations, where yellow-jackets and other wasps are attracted to the sweet aphid droppings. Melon aphid is somewhat difficult to control, and applications of synthetic pyrethroids will make the situation worse. Consider treating if melon aphid colonies are found in more than one site in ten. Newer materials such as Fulfill, Sivanto and Movento are more useful. See the 2016 Commercial Vegetable Production Recommendations for more options. With the recent rains, fields that previously appeared free of Phytophthora are now showing signs of the disease. In many fields, vines have senesced as fruit matured. Thus, vine health is not an indicator of the presence of Phytophthora. Fruit rot (see photo at right) is now the primary sign of infection. Growers should consider prompt removal of healthy fruit from fields expressing these symptoms. With more rain, the disease has the potential to spread. If possible, do not stack fruit to avoid the potential for individual fruit to rot above other healthy ones. These crops are being attacked by a variety of caterpillar pests now including, from left to right above, beet armyworm, diamondback moth larvae (DBM), imported cabbageworm (ICW), cross striped cabbageworm. 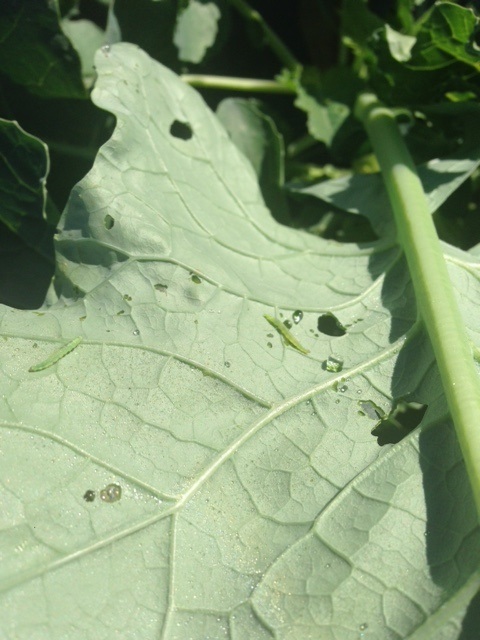 Cabbage looper is also present, but has declined of late in these plantings. Of all of these pests, ICW does the most immediate damage to developing tissue, but DBM and BAW are resistant to synthetic pyrethroid insecticides. Be sure to look at the interior portions of all plants. Sample 5 consecutive plants each, in 10 sites. 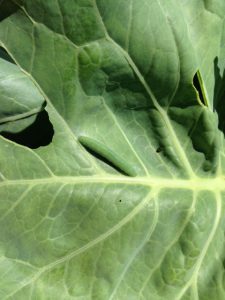 If the number of infested plants with any larvae is above 5% with heads present, or >20% before head formation, consider treating. In leafy greens, consider treating if infested plants exceed 10%. With DBM, it is important to use IRAC 28 (Coragen or similar) or IRAC 5 (Radiant or similar) insecticides to achieve adequate control.